Frederich Buechner encourages us to listen to our life and defines life as “being WITH.” So is it the icon on my wall that I am with? the books gathering dust on my desk? the children you may have created? the clock ticking away next to the land telephone and the stereo? or is LIFE the wide screen TV or the fragrances wafting from the kitchen stove? Or perhaps I am with the bouquet of roses on the mantel or the sweet little kitten asking for food or the five letters in this morning’s mail asking for funds to serve a worthy cause. Have you wept at anything during the last year? Have you thought seriously of the fact that someday you are going to die? Is there anybody you know in whose place you would volunteer to be if you had to suffer in doing so? 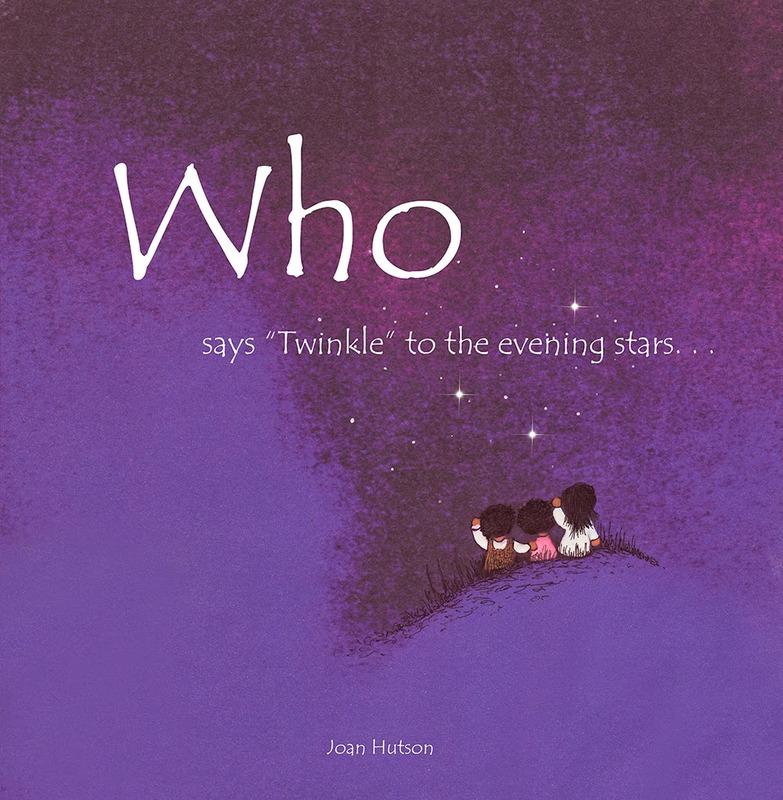 And God, I ask myself? Yes, God is with us, no matter what! Can we be with one another and with all else that is? That’s the bigger question. When it comes to the subject of "change" we humans are an interesting lot. We can vary from one end of the spectrum to the other. Some embrace change with excitement and anticipation, some are doubtful and hesitant, and some are completely resistant to change - "not me, Lord!". I am embarrassed to admit that I more often than not fit in this last group. At Holy Thursday Eucharist this year we had the reading of the story of the Last Supper from John's Gospel (Jn 13:1 - 15) which focuses on Jesus washing the feet of his disciples and not the Passover meal which the other three evangelists highlight in their Gospel of the Last Supper. 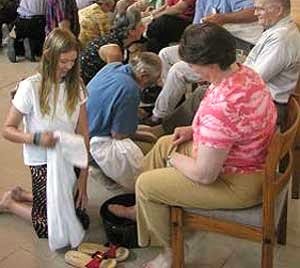 There were tender and touching moments during the foot washing in our chapel last Thurday. In case we were tempted to be distracted from the purpose of our gathering together that evening, Sister Mary reminded us in her homily that "Eucharist and foot-washing go together . . . The AMEN we say when receiving Eucharist is probably the most important act of faith that we make. That AMEN is essentially a commitment to be Eucharist, to be present, to be involved, to be of service, to break our bodies and pour out our blood for the life of others." 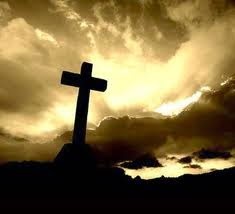 May your hearts be filled to the brim with Easter Joy! According to Eknath Easwaran, Words to Live By, the Sanskrit word for violence is himsa. The word for nonviolence is ahimsa, a state in which every trace of violence is removed. What remains in this nonviolent state is our natural consciousness: pure love. Violence, himsa, expresses itself in three different ways: 1) in our deeds; 2) in our words; and 3) in our thoughts. Most of what we call violence is in the form of action. So it is with our actions that nonviolence, ahisma, naturally begins. But as long as our minds harbor violent, himsa, thoughts, violence will find its way somehow into our speech and behavior. I’m especially ruminating on these personal violent-actions during this Christian time of Holy Week. I don’t exactly like what these ruminations are disclosing to me. Our sisters in the early years of the 20th century had a unique challenge and opportunity: how to build a chapel for our monastery that would be beautiful and serviceable into the future. 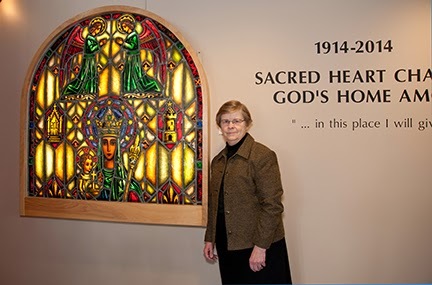 How they did that is the story of the exhibit, Sacred Heart Chapel, God’s Home Among Us, 1914-2014, presently open in Haehn Museum. Actually there are two distinct parts of the Chapel’s history—1914-1980; 1980 to the present. Both are related to liturgical practices of the time. Both are told through artifacts and photos. For instance, one example from the earlier years is the expansive elevated sanctuary floor and decorative altar; from the later years, the placement of the altar under the dome with pews for the assembly around it. A few of the artifacts to see in the exhibit are the choir stall of the prioress, the capital of a pillar, samples of various marble, a number of the many angels in the original Chapel; and photos of the assembly in worship and gatherings in the renovated and new sacred spaces. The visitor also learns of the decision in the 1910s to use only authentic materials—“If it says it is stone, it is stone” Community Chronicles. One cannot but be touched by the lasting beauty that endures. The majesty of the dome, the grandeur of the marble and granite columns, the grace of the enveloping arches—all remain a significant part of the present Chapel, as do some 200 angel cherub heads on the capitals. It is comforting to know that these cherubs, all with mouths open in song, have been with us for 100 years, and will continue to be silent partners in worship into the future. Haehn Museum is located in the Art and Heritage Place at our monastery. The exhibit will be open until December 23, 2014. Lectio divina, the Benedictine practice of prayerful, sacred reading takes many forms. 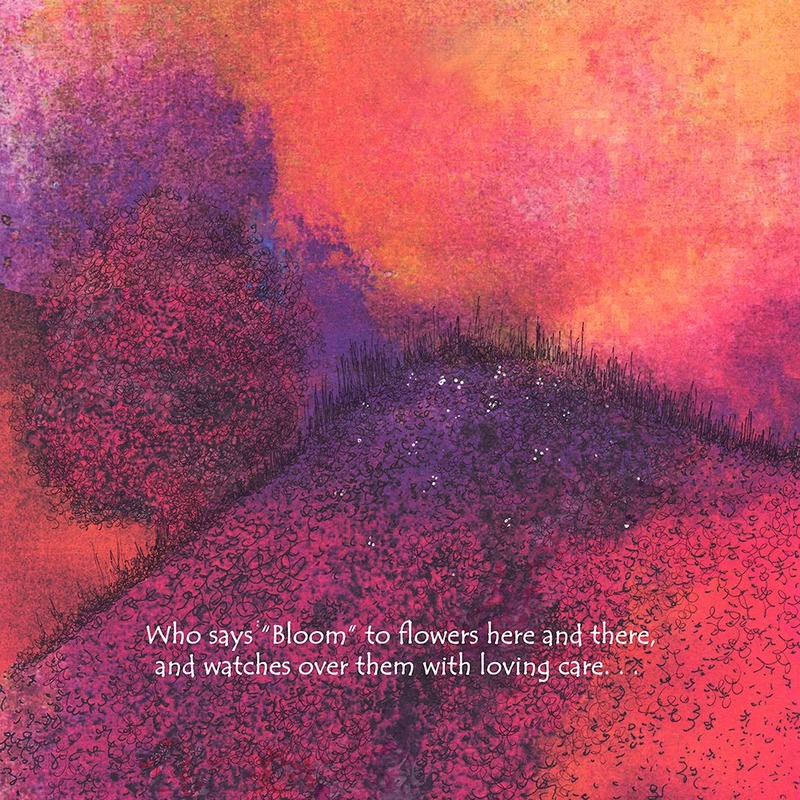 If you like questions that have more than a yes/no answer . . .if you love nature, children, and poetry . . . if you walk slowly and gratefully through our wondrous world, you can find God speaking all around us. with loving care . . .
Who says “Blossom” to the little plum tree . . . and who says “Ripen” to the plums you see . . . Thank You, God . . .
We have had some different light bulbs (energy saving, I believe) put into the Oratory and, I think, Sacred Heart Chapel and the Gathering Place. Personally, I'm most conscious of the ones in the Oratory because they're not as bright as the old ones and I'm conscious that there are some areas that now look quite dark. Lighting is an interesting issue in the Oratory. It is, for instance, very difficult to get good photographs there without importing special equipment. And, of course, that in itself could be a problem during services because we wouldn't want anything that distracted from the prayer which brings us there, however much we might want to capture the moment. Anyway, practical issues aside, the appearance of the new, slightly dimmer lights, led me into something of a meditation. 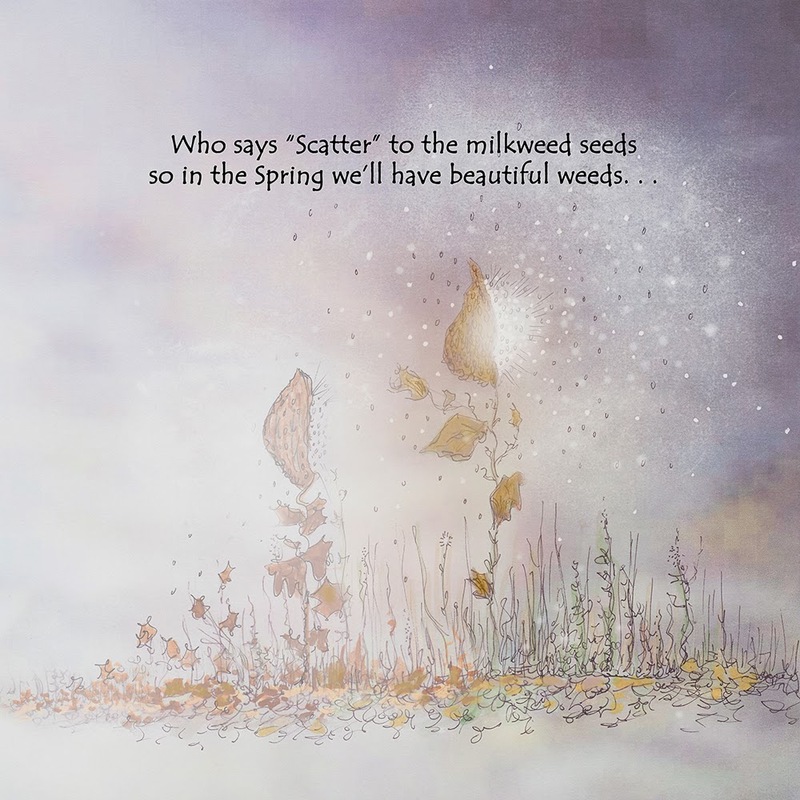 It made me think about how much we depend on light in the physical world: to see, to be able to appreciate the environment around us, to get about, to make plants grow. If we depend on light in the physical world, how much more do we depend on light, in the metaphorical sense, to illumine and help our spiritual lives to grow? It's so easy to let the inner light grow dim. 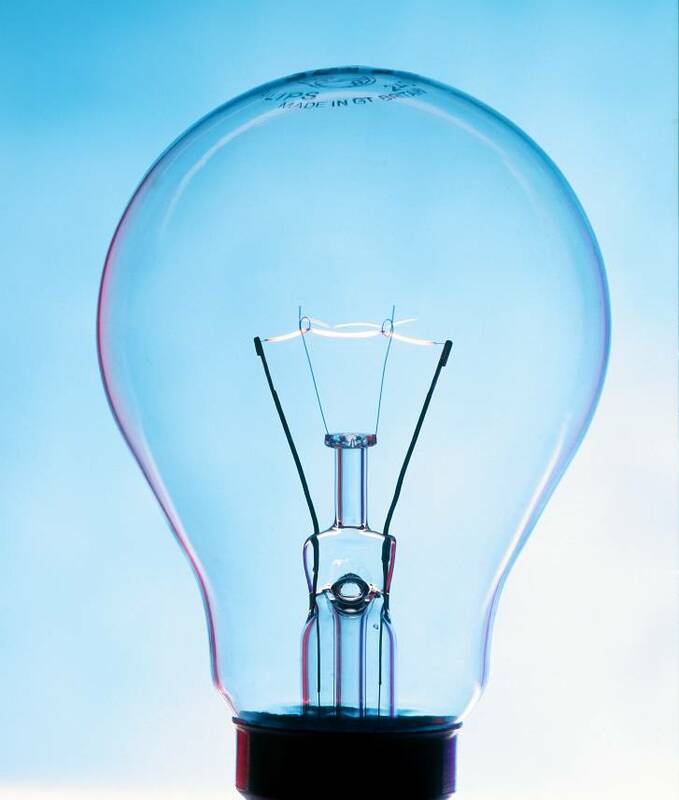 Energy saving light bulbs are a good in the world because, yes, they save energy and thus protect the environment! But energy saving on the internal illumination is not necessarily a good when it means that we make ourselves less open to the light of Christ and the light of the Gospels because we can't be bothered; it's too hard; it takes too much energy. Letting the light in means being willing to do whatever God asks of us, whatever it costs. It means being willing, as Jesus did, "to lay down His life for His friends." 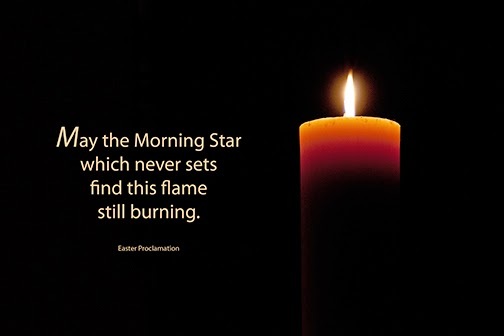 So, I'm praying that as I continue along the Lenten path, which can sometimes seem dark, that I stay alert and allow God's light to penetrate my inner darkness. I'm praying for the grace and courage to respond positively to whatever that demands of me. Finally, I'm trying to help myself do that by straining to glimpse the light of Easter which Christ carries ahead of me.